DACA and Hilhi's career-training programs touted by governor during Saturday commencement. Of the roughly 300 students who graduated from Hillsboro High School on Saturday evening, there were many outstanding accomplishments:several student were named valedictorian, dozens of others were the first in their families to graduate high school. But one student in particular stood out to Oregon Gov. Kate Brown, who gave the school's commencement speech June 9. "I'll call her Maria," Brown said. It's not her real name. "One of our graduates today is a Dreamer," Brown told a packed audience at Hillsboro Stadium during the school's graduation ceremony. "Maria came to the United States from Mexico when she was 2 years old. Her parents knew that education was the key to set the family on a path toward prosperity. Like the mavericks of the Oregon Trail, Maria's parents have risked much to create a better life for her, and Maria is on her way." The term Dreamer is widely used to refer to members of the Deferred Action for Childhood Arrivals program, better known as DACA. The Obama-era program offers temporary legal status to undocumented immigrants brought to the U.S. as children. For months, a national conversation has swirled around DACA recipients after President Donald Trump's administration announced it would be ending the program, calling for the deportation of 800,000 Dreamers. Congressional leaders have not come to an agreement about the program, and the administration's plans are being fought in court battles. In Hillsboro, where one in five families speak Spanish at home, Maria has lived two lives, Brown said, both as an American teenager and as an undocumented immigrant, but she hasn't let her legal status stop her. She plans to attend college this fall to become a bilingual teacher. She volunteers in her school and at the Hillsboro Library and Brown said teachers at Hilhi have supported her through her journey. "When Maria couldn't apply for federally-based scholarships (because of her legal status), teachers helped her find other opportunities," Brown said. "They mentored her throughout her college application process and while we continue to fight for a permanent legal solution for our Dreamers, Maria will continue to forge her pathway forward and clear a path for those who might follow her." Brown said Maria's journey was one that exemplifies the Oregon spirit. "It's a very Oregon story," Brown said. "In Oregon, we're mavericks." Hilhi is the only high school graduation ceremony Brown plans to attend this year, according to the school's principal Lou Bailey. Brown is speaking at the commencement for the Oregon Institute of Technology on June 16. 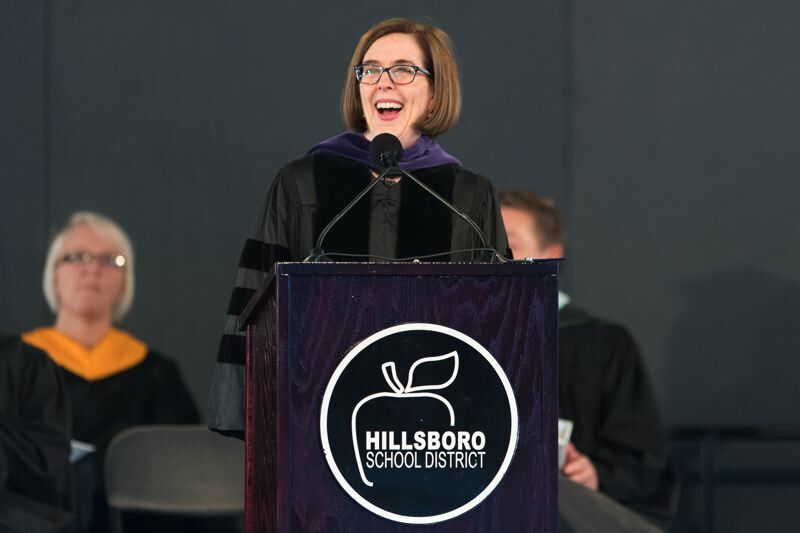 Brown said she wanted to speak at Hillsboro High's graduation because of its exemplary work as part of Brown's "Future Ready Oregon Initiative," a program that encourages jobs-training as part of school curriculum. Hillsboro is one of the few high schools in the state with an auto mechanics program, as well as horticulture, robotics and bioscience programs. It's 'Si, Se Puede' program for Latino students includes lessons on crafting businesses plans. "Every student in Oregon deserves these experiences," Brown said. "You cross this stage tonight with marketable in-demand skills. Hopefully you have some plans to use them." Brown told students to look at Oregon's state motto, "She flies with her own wings," for inspiration. "You stand on the edge of the nest, wings outstreched, sun on your face," Brown said. "The winds are in your favor and you are strong. You are ready to leap into the blue. So fly, soar and be the brilliant, gorgeous, talented and fabulous person you are meant to be.